Michelle Kazlausky was killed by a truck with failed brakes. Patti Byerly still has so many questions about the death of her twin sister this past summer. She knows some details, of course, and they are forever etched in her mind: Michelle Kazlausky was riding the Columbus-to-Athens leg of the Pelotonia Tour for cancer research on Aug. 21 when she was hit by a pickup truck and killed at the intersection of Rts. 180 and 374 in rural Hocking County during a rainstorm. Authorities say 58-year-old Ervin Blackston of Rockbridge had repaired part of the brake system on his brother's pickup truck just that morning. Then, prosecutors say, the brake line that Blackston had not repaired failed as he approached the intersection where a state trooper was stopping traffic to let the Pelotonia riders turn. Kazlausky, a 57-year-old medical technologist in the oncology lab of University Hospital East, was hit. Blackston has pleaded not guilty to vehicular manslaughter, a second-degree misdemeanor, and to an equipment violation. He is due back in Hocking County Municipal Court to change his plea Feb. 7. He could get up to 90 days in jail, though Prosecutor Laina Fetherolf said she won't ask the judge to impose any jail time. At Tallac we think about things a bit different. Instead of designing bicycle bags by sizes. We start with the items you need most and create bags to contain them. Each of our bags are tailored from the inside out. We give you the freedom of many smaller bags with easier access mounted to different locations on your bicycle. Our bags do to not rattle or have loose hook and loop straps. They are positively retained for a secure and quieter ride. Enjoy your ride. Nathaniel's great-great-grandfather was an inventor during the Industrial Revolution. His contributions include many but perhaps most controversial - the sights for the Colt .45. Get on your bike and see cool things. Check out this shot from my friend Dylan! What photos have you taken while riding that you would like to share? Post a link to them in comments or email me (raymondmgeorge [at] gmail.com) the link and I will post next week. Pick your best or favorite but please send just one. What's that at the end of the rainbow? Is it a pot o' gold? Nope! It's the 8th Annual Gravel Rouser Classic, a four-day buffet of recreational bike riding and low-key racing in Athens, Ohio. Attend all four events or pick and choose as you like. > After the day's ride, enjoy the Gravel Rouser Survivors Barbecue at the Oak Room restaurant. Pork BBQ sandwiches, cole slaw, potato salad and beverages await riders, and is included with your registration donation. You are welcome to change out of your riding clothes in the bathrooms at the Oak Room. Individuals who are not participating in the Gravel Rouser can pay $10 and enjoy the BBQ buffet. Welcome to Joe Bike. We’re eight Portland, Oregon, framebuilders, mechanics, designers, and cyclists who hand-make the world’s most useful bikes. We also run a full-service retail and repair shop that specializes in bikes for carrying kids and cargo, bikes for everyday transportation, and bikes for commuting hard and fast…or nice and slow. Check out our new ShuttleBug and Shopahaulic/Workahaulic modular longjohns, handmade in Portland of aircraft-grade chromoly steel and equipped with Gates carbon belt drive, Shimano Alfine 8- or 11-speed internal gearing, dual disc brakes, and more than a few design surprises. In a review of the top 5 utility bikes, Discovery Channel’s Treehugger.com recently ranked the ShuttleBug “the Champagne of kid/cargo bikes”. New to the shop: a new breed of serious urban bikes from a Portland startup company called Stop Cycles. 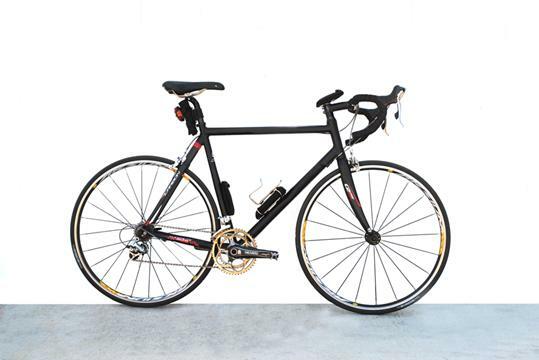 Joe Bike is the Portland area’s exclusive Stop Cycles dealer. We also carry Canada’s Norco brand of urban bikes and XtraCycle conversions. We’re also North America’s largest single-location dealer of the Yuba Mundo (another Treehugger top 5 cargo bike). BikeCaffe! Should I buy one and get it going in Columbus? 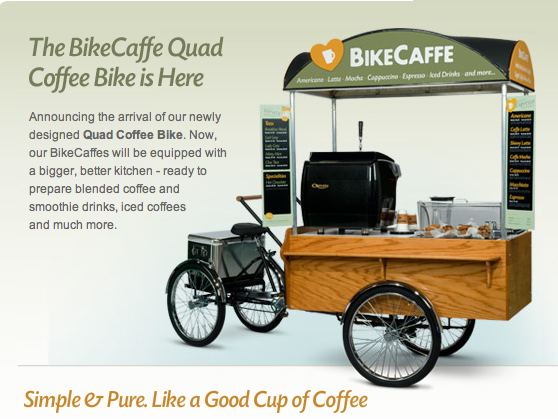 While the BikeCaffe bikes (they're actually Quads), look small, they are packed a surprising amount of equipment and operational function, all on a frame small and light enough to ride off at the end of a day spent pleasing coffee lovers' hearts. Tubless Kevlar Tires - no flats! MADRID, January 26, 2011 (AFP) – Tour de France champion Alberto Contador has been told of his punishment for his positive drugs test from the 2010 race, the Spanish cycling federation announced on Wednesday. “The federation has notified him of the sanction. He has a 10-day window in which to lodge an appeal,” a federation official, speaking on condition of anonymity, told AFP. The federation did not announce what the punishment was, a spokesman having said earlier that they would leave it up to the cyclist to do so. Spain’s sports media had reported that the rider may be suspended for one year over his positive doping test at last year’s event. “All indications are that the sanction proposed by the committee will be one year, so he will be stripped of his last win” at the Tour de France in July, sports daily Marca wrote. The only previous Tour winner to be stripped of their title was Floyd Landis in 2006. Made of 6AL-4V (Grade 5) aerospace titanium, the MAKO Bike Tool, named after one of the fastest shark species, will be the best bicycle tool that you have ever owned. Not only is it extremely light weight and compact but can be fully customized to best suit your bike. The MAKO titanium frame weighs only 19 grams and with the neoprene inserts holds four 1/4" driver bits of your choice (expandable up to 8 bits, with the upcoming upgrade kit). Why lug a bike tool around that is weighted with tools and functions that don’t even fit your bike? Boasting a bottle opener for the occasional “road soda,” 5 metric box wrench sizes, and 2 spoke wrench sizes, this is the first bike tool that you wont even notice in your pocket! Perfect for those quick rides where lugging around a bulky tool set just isn’t fun or appropriate. In Mike DeWine's first week as Ohio attorney general, his car collided with a bicyclist Downtown - and he ended up having the man taken on a 100-mile round trip to be treated by the officeholder's personal physician. Jonathan Kirk, 28, a dishwasher at Tip Top Kitchen & Cocktails, wasn't seriously injured, but he was shaken up in the Jan. 13 morning accident. According to a Columbus police report, confirmed by accounts from DeWine and Kirk, Kirk rode his bicycle against a red light at Front and Main streets [my emphasis]. He was knocked to the pavement by a 2008 Chrysler 300 in which DeWine was a passenger. A DeWine staff member, Robert Lagergren, was driving DeWine's personal car. Kirk, who said he has no insurance because he can't afford it, didn't want to go to a hospital emergency room and left the scene to make a scheduled appointment with his parole officer. However, DeWine tracked him down and insisted that he see a doctor. Editor's Note: It is disappointing to see that a cyclist who broke the law act like this. Keep reading the story and let me know your thoughts. 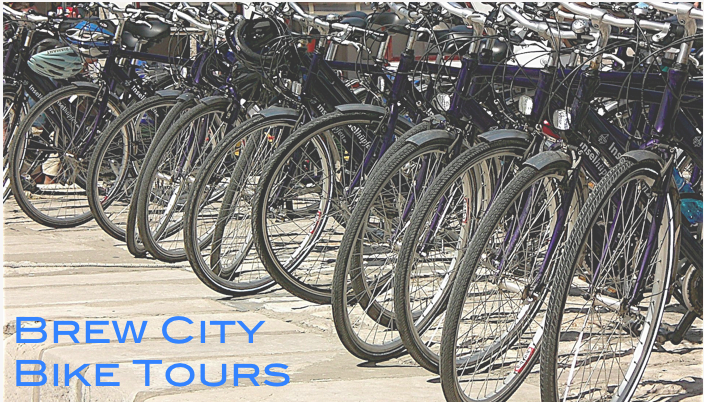 Brew City Bike Tours is Milwaukee's only bike tour co. Come take a microbrewery, food or history themed bike tour with the best-looking** bike tour guides in MKE. **this claim remains valid only so long as there are no other bike tour co's. Franklinton Cycleworks will be hosting a fund raising event complete with a Keg or two of local beer, a silent auction of cycling merch, and Columbus Underground's no. 1 band, Old Hundred. 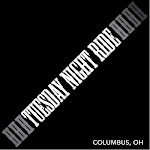 Come to support FCW and plug into Columbus's cycling community. on big screen TVs at 6:30 pm this Wednesday, January 26th. I am still taking orders for the gold/yellow DD jerseys (on display at the start) for a pre-order price of $70 (plus $5 for postage & handling). If interested, please e-mail me with your name and jersey size so that I will have some idea of how many jerseys to have printed up. Thanks to Emma Wang for the jersey design, and Washington Reprographics for signs & posters. Once they are done, they will be sold on my website and at Big Bang Bikes. Thanks to Glenn Pawlak & Big Bang Bicycles and Eat'n Park for sponsoring the 2010 DD. Product Description: The SpeedFold is designed using Ballistic Nylon for toughness and a clear side for showing your ID when needed. The SpeedFold easily holds a bunch of cash, multitool, broken teeth, business and credit cards. It can also fit many of the popular phones and PDAs such as the iPhone(r) and BlackBerry(r). Since it is weather resistant it can go with you on the bike, ski slope, beach or anywhere you do not need a big old honking wallet or purse!This unit was initially designed for the Iphone3 size wise. It fits an Iphone4 without a case.The more the unit is used the more give it will have enabling more stuff to be added. This wallet is not designed to hold a phone AND Co2 cylinders or tons of stuff with a phone. It is designed to hold your essentials and than perhaps fit a phone/camera/PDA for weather conditions. Another exciting day of racing came from South Australia on Sunday as the final stage of the Santos Tour Down Under took place over a 90km criterium circuit in Adelaide. The peloton of 130 riders tackled 20 laps of 4-1/2k each under sunny skies and in front of enthusiastic crowds. Race leader Cameron Meyer (Garmin-Cervelo) survived a tense day of chasing bonus seconds and owes a big thanks to Team Sky for going one-two in the sprint finish to keep Matthew Goss (HTC-Highroad) from stealing the race lead at the last possible moment in a true nail-biter of a stage. Ben Swift and Greg Henderson crossed just in front of Goss, giving him a four-second bonus for his third place victory. Goss had gained two-seconds in the first sprint lap of the day and had he finished first or second on today’s stage he could have won the overall, but Team Sky kept that from happening when their sprinters took the top two spots, leaving Meyer the victor over Goss by two seconds. Team RadioShack’s Lance Armstrong was presented by Premier Rann with a pair of R.M. Williams’ boots after today’s race. Accepting the gift he said, “Not only will I wear them the next time I come back, but I’ll probably wear them tonight!” Lance went on to acknowledge the great week the teams have enjoyed in South Australia, saying, “Thanks for a great few years, not just from myself but from all of us in the peloton. Look at the crowd here today. This is amazing. To start and finish here in this city and be all around in South Australia, to be treated like kings….it’s been a real pleasure and I congratulate you all for building an unbelievable event. I’ve said it several times this week - we travel all over the world and you do not see crowds and an atmosphere like this in very many places. I think this rivals the Tour, it rivals the Giro and all the big races. You should know that you made that. The Premier helped support it and had the vision but if the people don’t stand there and support the athletes and support the sponsors and the race, then it doesn’t happen. So from all of us, thank you all. Thank you for being here and thanks for supporting cycling.” Lance exited the stage to loud, enthusiastic applause in what he’s called his last international bike race.